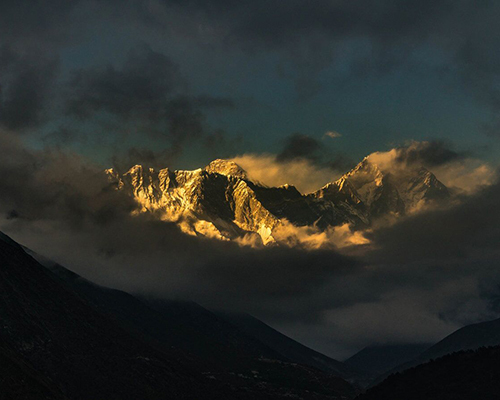 Everest Base Camp trek, the world’s most awe inspiring and iconic mountain trail trek takes us to the backyard of the world famous Sherpas, the culture of colorful prayer flags and Buddhism, the quaint Namche Bazzar, the Sagarmatha National Park, and the mightiest view point-Kala Patthar. 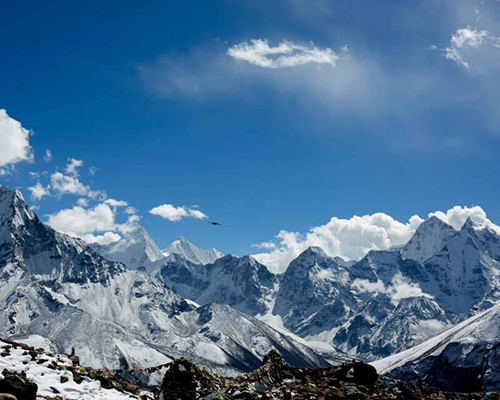 Everest Base Camp trek has the reputation of being the grandest walk in the land of the Himalayas. It begins with an inspiring mountain flight to Tenzing-Hillary Airport at Lukla and gets better as you go. 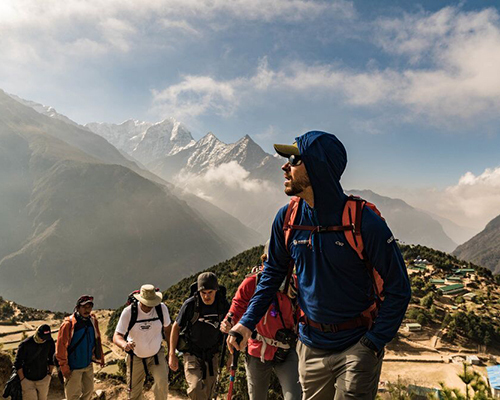 On this expedition, we will also cross two high passes with spectacular vistas of countless Himalayan giants, climb Gokyo Ri before culminating in an attempt on 20,070ft Lobuche East, in the heart of the Khumbu. A non-refundable deposit of $750 per person secures your reservation. Payments may be made via MasterCard, Visa, American Express, or check. Upon arrival in Kathmandu, you will be met by your NEM and Nepalese guides and transferred to the hotel. The drive from the airport to the hotel is around 20 minutes. The evening is free but your guides will organize a welcome dinner at a fine local restaurant. Overnight in Kathmandu. Yes. The people of Nepal are extremely friendly. Their economy is supported by foreign currency so they may ask you to visit their stores but they will not beg. You should feel safe and secure in Nepal. Yes. You can purchase a $5,000 rescue insurance policy from the American Alpine Club for $45. Additionally, we highly recommend that you purchase trip insurance. In the case where you trip is cut short, this is how you will get a full refund. Do I need to bring extra medications? Yes. You should bring basic medications in addition to any prescriptions that you need. Consider bringing a small kit with Ibuprofen, Tums, Ant-Acids, etc. Respiratory illness in the form of a cough and upset stomach are common issues associated with the altitude and diet. Yes. Boiled water is available at every tea house. We do recommend that you bring or purchase chlorine tablets to ensure that the water is potable. Do I need a warm sleeping bag? No. You will be provided with a -20 sleeping bag, a duffle bag for trekking and down parkas. Yes, if you purchase a sim card in Nepal. You must go to your local provider before you leave to “unlock” your phone. Can I recharge my batteries? Yes. Each tea house has battery charging capabilities but they charge a few dollars per hour. If you own a portable solar panel charger then we recommend that you bring it. Yes. We recommend you bring a few books, playing cards and some music for down time at the tea houses. At limited tea houses they provide shower service. Showers cost approximately $5US. They will tell you that they are warm, but plan for a cold shower. Yes. Some tea houses provide laundry service but it is quite expensive. Plenty. We recommend 5-10 pairs. We recommend that you bring a sturdy pair of hiking boots and a pair of trail sneakers. Depending on the weather conditions, you may wear one or the other. Should I bring any luxuries? We recommend that you bring a designated change of warm, comfy clothes for lounging around the tea houses. 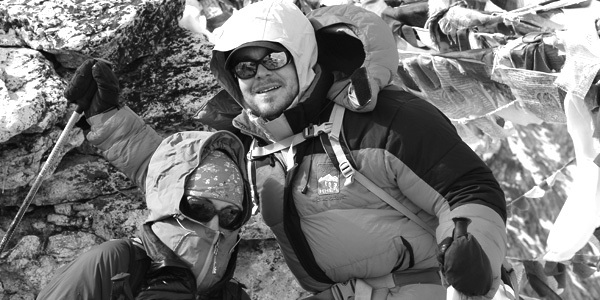 For those looking to skip the climbing, we have a co-current itinerary for an Everest Base Camp Trek and the high passes. 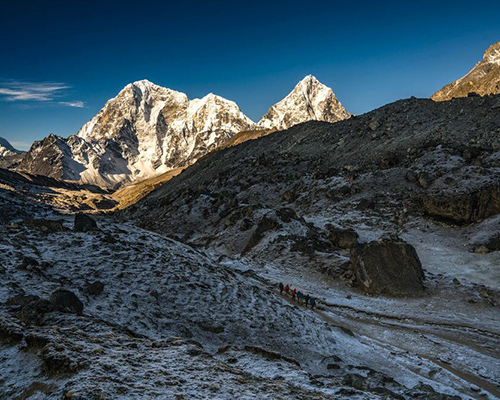 Everest Base Camp trek has the reputation of being the grandest walk in the land of the Himalayas. It begins with an inspiring mountain flight to Tenzing-Hillary Airport at Lukla and gets better as you go.